Alter Egos > Movie Nights > ** SOLD OUT ** A Jump to the Left! ** SOLD OUT ** A Jump to the Left! We would like, if we may… to take you on a strange journey. Slip into those fishnets and get ready to to do the timewarp again, and join us for an interactive screening of The Rocky Horror Picture Show. Dress up as your favourite RHPS character (there will be prizes for best dressed) and participate in the experience. Just like in the 70s we will be providing interaction scripts and props for a night like you’ve never experienced! …and then a step to the riiiiiiight. 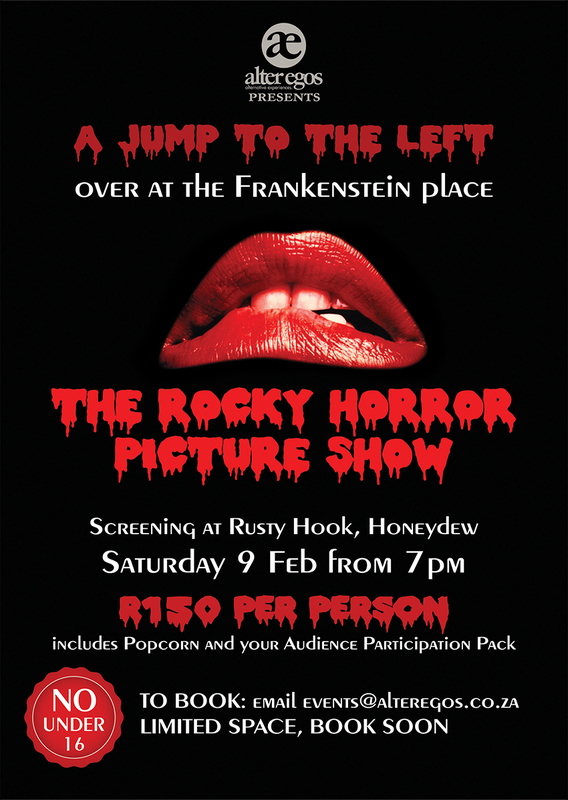 R150.00 per person gets you a seat, a bag of popcorn and your Audience Participation Pack! Cash (or card) bar plus food, snacks and sweets on sale. Make sure you arrive early to find the ideal spot, as seating will work on a first come, first served basis darlings!